Discussion Pockets Plugin not working ? Pockets Plugin not working ? 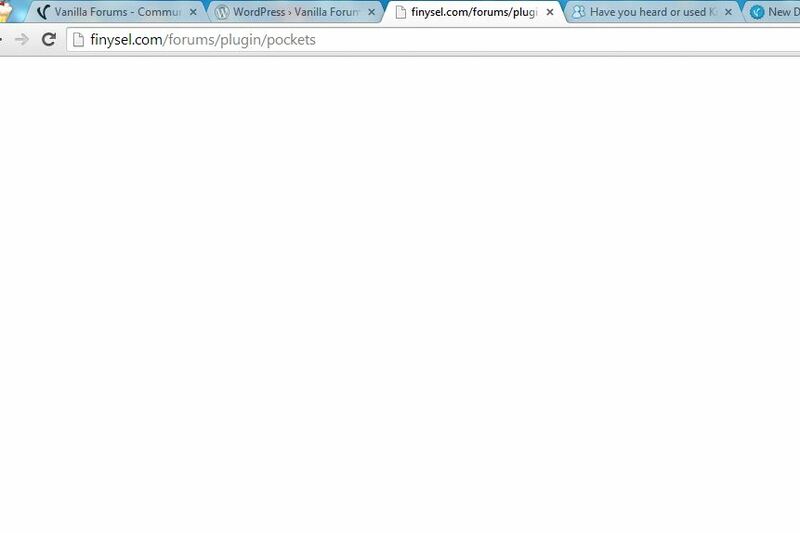 I have installed Pockets plugin that Allows site admins to add free-form HTML to various places around the application. But it is showing blank pages on the clicking Settings .. Please enable debugging by adding $Configuration['Debug'] = TRUE; to your /conf/config.php file. Then visit the page and share the error with us. 'Version' => '1.1.2' of pockets. started returning me a blank page. I have removed pockets and now everything works fine. What can be the possible problem, Is Pockets no more working on the new vanilla ? One of your problems is, you don't know your version numbers of either your plugin is or vanilla is And we don't as much as we like to extrapolate. Finding these out would be a good starting point. as well as what Bleistivt said. Many people have said latest version, only to find out it was only semi-latest or partial-latest or next-to-latest or later than latest which could be equally troublesome in some circumstances.. I don't know where to place that debug code. Trying to learn. best way to learn is read the documentation, readme, and installation instructions. click documentation above - you can see a button at top left.. then click troubleshooting. alternatively you could read the readme or the installation instructions, or search the forum. It is answered in no less than 5000 places or discussions. I don't know where to place that debug code. When you read the docs, you will find a section that relates to the config.php which is where all the settings and info are stored. It is important you become familiar with this file. This is the back door to the dashboard in case you can't access the UI. Add this line in there so it shows more info on any error. I have downloaded addons-master.zip and installed the pocket plugin from there and now its working ..! its a miracle when you follow instructions. glad you read them and they helped. What changes do I need to make ?